Yato and his former shinki Nora’s efforts to preserve Ebisu’s life have come to naught. Ebisu, god of fortune, managed to escape the hell in which he was briefly trapped, only to face the wrath of his fellow gods. Found guilt of dabbling in forbidden magic, the god was executed and then, as is the manner of his kind, reincarnated. Ebisu escaped the death god Izanami’s realm. Yato and Nora did not. Ages spent alone have left Izanami determined to force visitors to stay. Her obsession has not sapped Izanami’s impressive powers. On his own, it’s unlikely Yato will ever escape. Yato has friends and allies in the mortal realm, even worshippers. Armed with Yato’s name, they could call him out from Ebizu’s realm. If only Yato had ever told them what his true name actually was. It’s weird how shunning someone for millennia can have a negative effect on their social skills. I cannot help but feel that many of Izanami’s problems could have been mitigated with an internet feed; that would allow her to interact with people without her personal appearance (the whole half-rotted god of death deal) getting in the way. Her ability to present herself in acceptable forms would no doubt serve her well. On the internet, nobody knows you’re a death goddess. Ten volumes into the series, Adachitoka is finally getting around to providing more of Yato’s backstory. The Yato of old was not at all the wacky layabout we met in the first volumes of the manga. Yato used to be a god of destruction, annihilating such unfortunate mortals as incommoded him. He’s trying very hard to reinvent himself … despite the notable disadvantage of having been called into existence by a complete monster. While in retrospect it seems obvious that if gods are the product of human worship, humans should be able to create bespoke gods, I cannot offhand think of another example of someone setting out to deliberately forge a specific deity though fervent belief. Well, perhaps in Max Gladstone’s work. Yato’s Father sounds like a thoroughly bad sort, and worse of all, he’s good at long-term planning. Is he going to be the big bad for the rest of the series? I doubt it. Based on my past experience of fantasy, he’ll be defeated handily and a new big bad will arrive on the scene. I can’t wait. 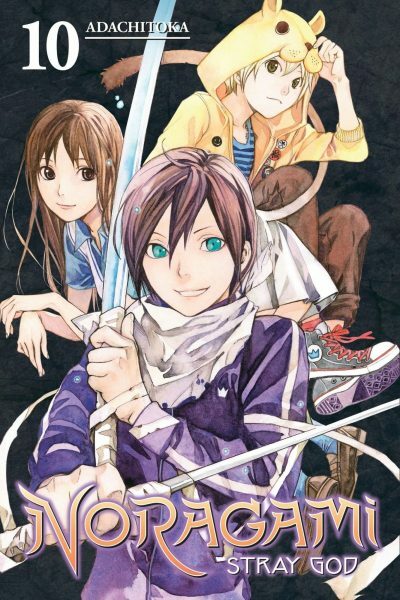 Noragami, volume ten is available here (Amazon) and here (Chapters-Indigo). P. C. Hodgell's God Stalk has some humans working to remodel, as it were, an existing deity. That's not forging a god from nothing, but it's not a million miles away.